‘Discover how to trap real flowers and leaves in your textile work with the innovative use of Bondaweb combined with free machine embroidery. 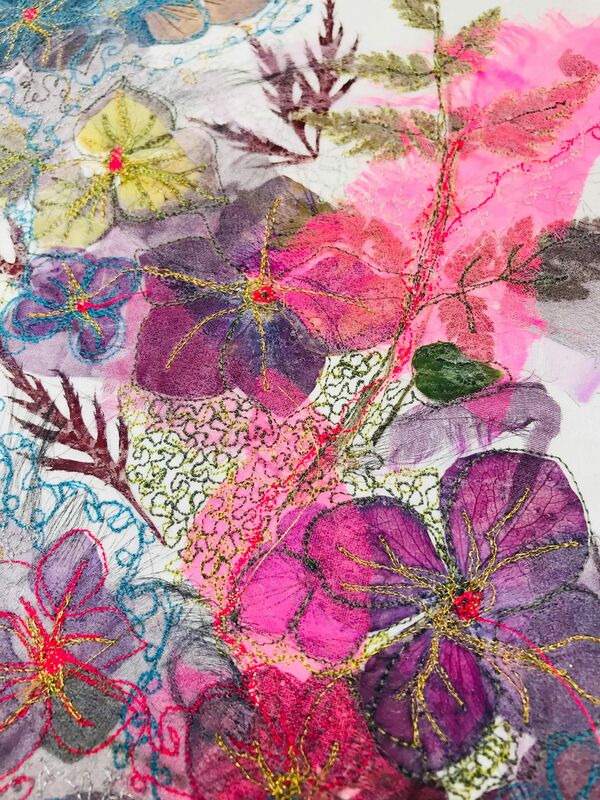 Working directly on dupion silk you will be shown several machine embroidery stitches which complement the flowers beautifully. You will go home with an embroidered panel which will withstand the test of time’. A couple of large petal Hydrangea heads from your garden – only if you have them! Any colour. Pansy petals are lovely also if your garden can spare any. 3 available	 Hydrangeas - C24/07/19 £45.00 If you have a basic sewing kit you would like to bring ( scissors, needle etc. ) you are more than welcome to bring them. If you have embroidery threads, please bring an array of colours with you. We have a small selection of colours available on the day.